Department of Electronics and Communication Engineering, Gauhati University, Guwahati, India. 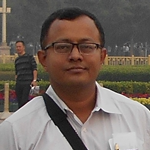 Dr. Kandarpa Kumar Sarma, currently Professor and Head, Department of Electronics and Communication Engineering, Gauhati University, Guwahati, India specializes in mobile communication, machine and deep learning, speech processing, speech processing and antenna design. He is a Senior Member of IEEE (USA) and Fellow of IETE (India). He is an author of several books and papers published in peer reviewed journals and international conferences.